ESTERO, Fla. - With two weeks left in the 2018-19 regular season, the Florida Everblades (45-16-5-1, 96 pts.) welcome the Norfolk Admirals for a three-game series this week at Hertz Arena. The Everblades are coming off their only one-game week of the regular season, which featured their sixth shootout game of the year and fourth in a two-week span. Entering Saturday night against Orlando, Florida had not lost in a shootout at home in more than a year, dating back to a 4-3 shootout setback against Greenville on Feb. 2, 2018. After Nathan Perkovich scored in the first round of the shootout for Florida, Orlando's final two shooters both scored to give the Solar Bears the extra standings point. Florida plays its last three-game week of the regular season this week, hosting the Admirals for the second time this year. 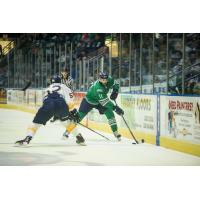 The two teams haven't faced off since the end of November when the Everblades earned five of six possible points in a three-game set in Norfolk. The 'Blades started their home schedule with a two-game set against the Admirals on Oct. 19-20, falling 1-0 in their home opener before drubbing Norfolk, 6-1, in the series finale. Since the 'Blades lost captain John McCarron and alternate captain Joe Cox to AHL call-ups, rookie Blake Winiecki has picked up the pace offensively. He registered an assist on Saturday against Orlando and has at least one point in nine of his last 11 games (9g-6a). Winiecki's 54-point season is tied for the highest point total by an Everblades rookie since Matt Willows' 66-point campaign in 2015-16. Rookie goaltender Jeremy Helvig has shouldered the load lately in between the pipes, starting in seven of Florida's last 10 games. He is fourth in the ECHL is goals-against average with a 2.33 mark and is tied for the league lead among rookies with 24 wins. Perkovich has been another key offensive weapon of late and recorded a goal on Saturday. The 33-year-old has points in seven of his last eight tilts (5g-5a). He scored in the shootout on Saturday and has three shootout goals on four attempts this year. Florida's power play stayed red hot on Saturday with two goals on four chances. The Everblades have at least one power-play marker in seven of their last eight games and have converted on 35.1 percent (13-37) of their power plays in that stretch. The Everblades were previously the ECHL's only undefeated team in shootouts this year before Saturday's shootout loss to Orlando and had their six-game winning streak in overtime and shootout affairs snapped. This season's series with Orlando has involved a lot of nail-biting affairs. With Saturday's shootout contest, the two teams have gone to overtime in five of the 11 total matchups. The most overtime or shootout games Florida has against an opponent other than the Solar Bears is two (Greenville/Atlanta). Florida has capitalized on Orlando's weakness on the penalty kill. The 'Blades have converted on 12-of-33 power plays in the last seven meetings with Orlando and have scored multiple times on the power play in six of those games.